Jessica by Jessica Park | Through the eyes of fashion. Karl Lagerfeld's muse Lady Amanda Harlech. 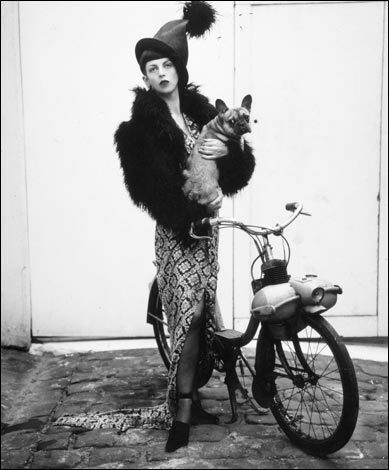 Alexander McQueen's muse Isabella Blow. Tom Ford's muse Carine Roitfeld. Yves Saint Laurent's muses Loulou de la Falaise and Betty Catroux. Marc Jacob's muse Camille Miceli. Another day passed by as the gloomy clouds and sprinkles of rain lingered from above New York City. I spent the day at the Charles Nolan showroom amongst the modern galleries along the river in Chelsea. While I was admiring racks of his signature tailored dress shirts and organza pleated dresses, I noticed a painting by Margaret Keane. The big beautiful alluring eyes drew me into the soul of the painting and I just couldn’t stop gawking. The eyes told a story of intense emotion and wished I could read into a person’s total self by artistically capturing their eyes. 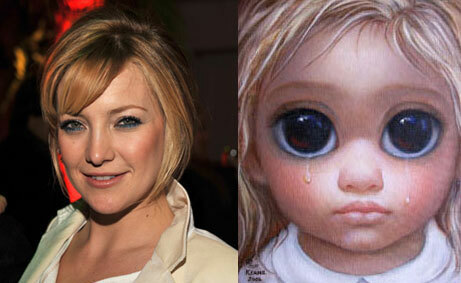 Kate Hudson portraying Keane in an upcoming movie. Yes, I will embarrassingly admit that I own Juicy track suits but only because they are so comfortable to sleep in. I was admiring the new Juicy Couture store on 5th Ave. and was really blown away by their strong identity and branding. Royal military mannequins dressed in plaid kilts, tulle, and covered in their signature velour. Basically I think Juicy is the only profitable company Liz Claiborne has invested in, although I think that Kate Spade might have a second coming. Gela and Pamela the brains behind Juicy have extended their line adding the trendy Couture Couture, a high end line targeting those trust fund babies (price points seem start at $1000). Hmmm… they seemed to have licensed themselves out. Could Taylor Momsen be our new fashion icon? Who needs wacky Deyn? Most of my generation has grown up watching the Olsen twins on television. I must admit that I have always been drawn to their sense of style and interpretation of creativness. Mary Kate and Ashley have many projects under their wings including a clothing line named, Elizabeth and James but more recently, they have delved into writing a book entitled, Influence. The funny thing is that they bend the focus of their collection into a vignette of raw interviews of fascinating people who have shaped them, not the other way around. Their book fixates on people such as Jack Pierson, David Collins, and Robert Lee Morris who have influence their journey into developing their unique spirit. Eventually they reveal their ideas on creative distinction between feeders of the public such as Andy Worhol and more reclusive artists who don’t pay attention to the visions of the outside world. I can’t wait to get my copy of this book! Influence by Mary Kate and Ashley Olsen. Do we love Rachel Zoe? I was reading some blogs today and ran across this hilarious post in NYMag.com’s, The Cut about Rachel Zoe. I will say I’m sad that her new reality show, The Rachel Zoe Project has already aired it’s season finale. She has this excessive boho thing going on which I’m totally into right now. Will ‘The Rachel Zoe Project’ See a Second Season? Or just another shameless spender for the world to joyfully resent/envy? However one sees it, the first episode’s ratings were better than the first episode of Project Runway‘s. So it seems rather odd that Bravo hasn’t confirmed if it will shoot a second season. “Nothing’s official, but if Bravo asks, I’d love to. I can take it,” Zoe says. Maybe you can, Zoe. But can the world? Can we see past superficial narcissism?